Want to Help 13 Million Children? 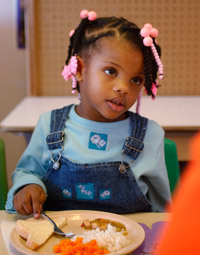 Inaya Green looks up at her grandmother while eating lunch in a preschool program at the Friendly Fuld Neighborhood Center in Newark, one of New Jersey’s poorest cities. The Senate is currently considering legislation (S. 3355/H.R. 6049) that would expand the Child Tax Credit to provide assistance to a greater number of low-income families, helping them to cope with the growing financial challenges associated with the current economy. The Child Tax Credit helps families manage the costs of raising children. Yet certain rules leave the neediest families behind. An estimated 10.6 million children in low-income families were completely ineligible for the Child Tax Credit in 2007, and an additional 11 million low-income children received less than the full benefit amount—all while families making $75,000-$100,000 receive the greatest benefit. Families that are excluded include those who have low wages because they have a full-time job that pays the minimum wage or a little above; they are employed in temporary and itinerant jobs; or they have spent some time away from the workforce due to family illness or disability. Families can receive up to $1,000 per child. There are two components to the credit: the basic CTC, which is non-refundable and only available to families who earn enough to pay taxes, and the additional tax credit, which is refundable, and available for families who earn above $12,050 in 2008. Current legislation focuses on the refundable additional tax credit. Families can always collect the value of the additional tax credit, no matter what they were required to pay in taxes during the year. But because this refundable portion of the Child Tax Credit has a minimum income requirement of $12,050 for tax year 2008, and the actual value of the benefit increases according to earned income, those who make more also collect more. The House and Senate bills include several tax-related provisions, but both would lower the income floor for the refundable child tax credit from $12,050 to $8,500. Legislation was passed in the House of Representatives and was introduced in the Senate. If it becomes law, nearly 3 million children will be newly eligible for the credit and 10.1 million will receive an increased monetary benefit. *Based on an alternative measure of poverty derived from standards developed by the National Academy of Sciences. Read "From Poverty to Prosperity: A National Strategy to Cut Poverty in Half"